The Setup stage begins with receiving an award (congratulations!) or, if not externally funded, securing internal approval and resources. It involves preparing the project for launch, including confirming that all compliance requirements are met, and making final arrangements for resources and facilities, and for collaborations. In some cases, the various administrative and scientific/programmatic activities may progress from the Setup stage to the next stage (Manage) at different times. The Principal Investigator (PI) is responsible for all scientific/programmatic and compliance aspects of the project. 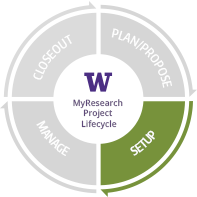 The research team led by the PI, works together with administrators in schools and colleges, and central offices to address all compliance issues and make final preparations for project launch. When the notice of award is received, the Office of Sponsored Programs (OSP) negotiates the terms and conditions of the award and issues a Funding Action (FA). Compliance assurances and other information must be submitted to OSP before accessing the award. Grant and Contract Accounting (GCA) will establish the UW budget number. When a potential sponsor requires additional materials or compliance verification before making an award, ensure you involve the Office of Sponsored Programs (OSP) in responding to the request. When you receive an award, send to osp@uw.edu reference the eGC1 number. For pre-award spending, use the Advance Budget Number Request Tool. Compliance requirements (e.g. IRB protocols or Financial Conflict of Interest) may involve multiple departments and levels of review and should be dealt with as early as possible to prevent delays in launching the project. Confirm all regulatory requirements are in place to allow spending to begin (protocol approvals, data security, etc.). Agreements such as subawards, data use agreements, or confidentiality agreements are in place and signed by the appropriate University official. Set up all budget numbers and sub-budgets and establish internal controls for spending and tracking expenditures. Set up calendar for completion of regular reports, invoicing and other regularly scheduled tasks and include your UW budget number Final Action Date.